“Zu sagen mir weshalb so gern die Kater Hering fressen. (So tell me why tomcats love to eat herring. 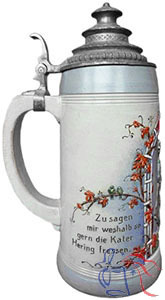 To appreciate the text on this stein it must be understood that the tomcat (Kater) is both a German symbol and idiomatic expression for a hangover; pickled herring and alleged cure.